Budweiser has announced more than 50 per cent of the barley used in its UK beer is now grown in Britain and has set a target to get to 100 per cent. And it could offer milling wheat growers the opportunity to diversify their crop and help fight blackgrass. Jason Warner, president of Budweiser’s parent company AB InBev told growers at the annual Bud Farmers Day they were going to need more crop. “I would love to source all of my crop from the UK,” he said. The company has used its ‘SmartBarley’ scheme to introduce new varieties, including the Explorer grain, which has allowed them to build their UK sourced barley and allow farmers to grow crops in areas which had not previously been suitable. It is used by 147 farmers across the UK and allows them to benchmark against 4,500 other barley growers across the globe. Matthew Hayes, brewing manager at its Magor Brewery in South Wales, said the barley’s specifications were crucial for Budweiser, which were probably more demanding than for other beers. “It is an extremely precisely controlled process; we want to give our consumers the best possible product at all times and a key part of that is the raw materials," he said. “We want to use a UK supply of barley for our Budweiser being produced in the UK. It is a great UK success story as well because we now export Budweiser from the UK out to countries throughout Europe and to the Middle East." Mr Hayes said quality was key. “It is a great American beer, produced in Wales and Preston," Mr Hayes added. “It needs to be fresh, it is a light beer. You have to be so much more accurate and so much more precise, so freshness is absolutely key. Milling wheat growers looking to diversify their crop or fight blackgrass were encouraged to consider growing malting barley. 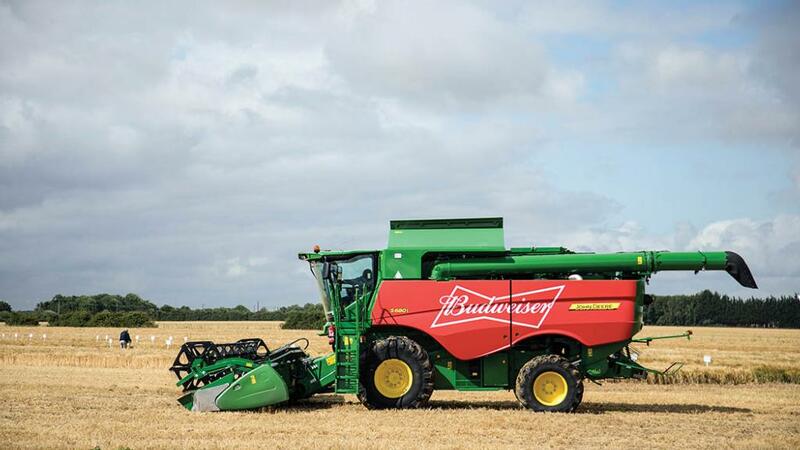 The barley used for brewing Budweiser is not being grown in ‘traditional’ malting barley areas and Glencore’s Nick Oakhill encouraged growers who had not grown malting or spring barley to get in touch. “We are looking for high protein, high nitrogen barley, not a traditional low nitrogen barley maltsters would normally require,” he said. “We will take barley that is up to 2.1 per cent protein whereas for most it would only be suitable for feed. Cambridgeshire farmer Edward Davison said he started growing barley in 2015 predominantly for blackgrass control. “Barley is very good at smothering out blackgrass when it is in the crop and naturally being a spring crop you have got all winter to chase the weed," he said.